Kirkby Milers Safari 10 - 29th September 2019. Our third year is here. Our one loop, 10 mile course will be chip timed and is a fast course, with a little hill near the end. Expect the best medal this side of the Sahara. The very popular fun run will once again take place. Make sure your cheeky monkeys don't miss out on this 1 mile fun run. 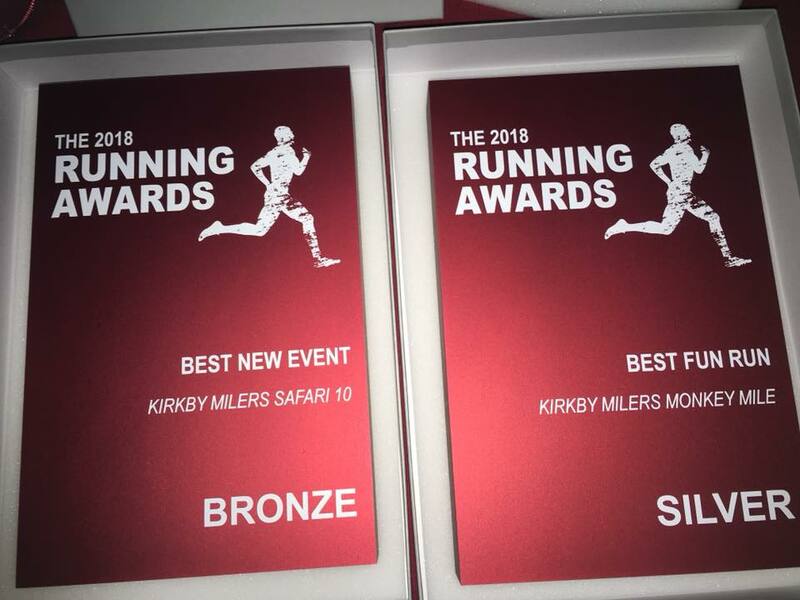 Kirkby Milers Safari 10 & Monkey Mile Fun Run 2018 - Roaring Success. Well didn't they do well...awards for both races. A small group took a trip to the o2 Arena in the capital after we got shortlisted for two awards. Against some big hitters, we managed to take home some bling in both the categories we was shortlisted in. We took home 3rd place for 'Best new event' and 2nd place for 'Best fun run'. WE THANK YOU ALL VERY MUCH FOR TAKING THE TIME TO VOTE FOR US...... Next year lets make it 1st place! !